In this step, you will make Product a parent of Ordered Product and manipulate the sequence of Ordered Product's identifying elements. Note that Ordered Product has inherited Product's identifying element, Product Number, as one of its identifiers (denoted by an asterisk in brackets). Note also that Product Number has become the first identifying element of Ordered Product. However, it is usual in an order processing system for an entity like Ordered Product to have Order Number as its first identifying element, such that data can be easily read from the file in Order Number sequence. 2. Open the Maintain Entity Elements window for Ordered Product. 3. Move Order Number above Product Number. Note that, because Order Number and Product Number originate from two different entities, the sequence of the inherited identifying elements can be changed. 4. 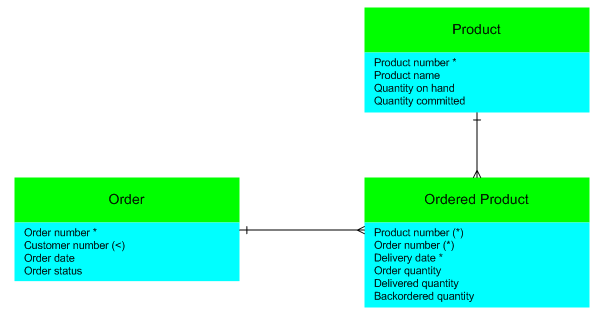 Display the Change Relationship dialog for the relationship between Order and Ordered Product. Note that the Logical View Name for the relationship is disabled. No logical view will be created to support this relationship; it will be supported by the natural order of the entity's identifying elements. Display the Change Relationship dialog for the relationship between Product and Ordered Product. Note that the Logical View Name is enabled. This is because the relationship is the second parent/child relationship to affect Ordered Product's identifying elements, so a logical view will be created to support the relationship.